Matthew Pointon questioned why the title of this painting is officially ‘Girl Reading’ when on the frame it is called ‘A Fair Student’ and asked who changed it. Pointon outlined that the painting was referred to as ‘Reading Girl’ as early as 1878 by the Royal Academy Times, later referred to as ‘Girl Reading’ in 1998, but by 1917 had the title ‘A Fair Student’. Pointon proposed that it was the Royal Academy that changed the title but was unsure of the reasons why. The inconsistent title prompted an in-depth discussion. 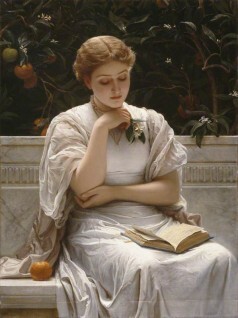 Scott Thomas Buckle supported Pointon’s suggestion that Girl Reading was the original title in 1878, proposing that the alternative title was given when it was exhibited sometime between 1878–1917. Barbara Bryant agreed with Buckle’s theory and gave further evidence highlighting that the painting was also referred to as Girl Reading in 1878 by The Illustrated London News. Bryant noted that a change of title can simply be down to the personal choice of the owner or the auction house. Kieran Owens discovered that the ‘Girl Reading’ is Catherine (‘Kate’) Elizabeth Macready Dickens, wife of the artist Charles Edward Perugini and daughter of Charles Dickens. He gave further contextual information which Antoinette Gordon added to, suggesting that Perugini painted several portraits of women reading, complicating the matter further. However, Grant Waters (Art Detective Group Leader, South East England and East of England) pointed out that Perugini may have sold the black and white reproduction rights to a publisher who preferred the more commercial title Girl Reading. This implies that the painting could have been originally named A Fair Student and changed as early as 1878. After giving an insight into the sitter’s academic background, Antoinette Gordon suggested that A Fair Student would have been a more appropriate title for Perugini’s talented wife, further indicating that this was the original title. On the other hand, Andrew Greg strongly supported Buckle and Bryant, stating that it is almost definite that Perugini labelled his artwork Girl Reading when he first exhibited it in 1878. Greg agreed with Bryant’s suggestion that the title plate was added later, adding that they are normally added by collectors or galleries and not by the artist. Greg also suggested that the painting was intended to be a genre painting not a portrait, and Girl Reading appears a more impersonal and therefore appropriate original title. He concluded the discussion by summarising that the painting was referred to with this title in 1909 when owned by Sir William Eden. It appears that the title was changed to A Fair Student between Eden’s death in 1915 and the painting’s appearance in the catalogue of new owner James Blair in 1917. As a result, the discussion concluded that the original title was Girl Reading and that therefore neither Art UK nor Manchester Art Gallery needed to alter the name of the painting. Why was this painting's title changed from 'A Fair Student' to 'Girl Reading'?